Arabella Holmes dreamed of becoming a purveyor of abnormal science, a Boneseeker for the Mutter Museum. Henry Watson arrives at the Mutter with a double assignment: To become a finder of abnormal antiquities and to watch over Arabella. Together, they are assigned to a most secret exploration. The hand of a Nephilim has been unearthed in upstate New York. When the pair is taksed to find and recover the skeleton, they discover they are the second team to have been deployed and the first team is dead. If Henry can get Arabella to talk to him, he might just be able to keep his promise to protect her from whomever doesn't want them to uncover the truth. I have an anthropology minor—mostly in Papua New Guinea #veryuseful. Well, it wasn’t…till I started penning this series. It was then my own bone obsession took off. I have a small library of forensic anthropology books…i.e. the science of talking bones. Who knew bones could communicate so very much after death. Well, they can. 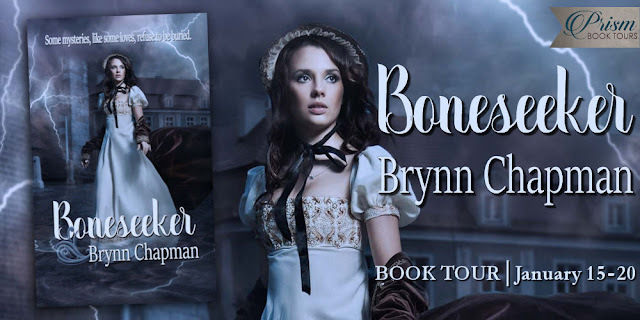 I am a multi sensory writer—so here are some links to my Pinterest page for Boneseeker…and while you’re there, check out HERE WALK THE DEAD—book 2, which will be set in an asylum. Born and raised in western Pennsylvania, Brynn Chapman is the daughter of two teachers. Her writing reflects her passions: science, history and love—not necessarily in that order. In real life, the geek gene runs strong in her family, as does the Asperger’s syndrome. Her writing reflects her experience as a pediatric therapist and her interactions with society’s downtrodden. In fiction, she’s a strong believer in underdogs and happily-ever-afters. If her ancestry tree is true, she is a descendent of the House of Stuart. Book cover looks ominous and scary. I wonder who won this contest. there will be another Giveaway ending 1/24! Thank you for your comment and support on my site.